Cambridge MP Julian Huppert is backing a national campaign to raise funds and awareness in the battle to beat the UK’s biggest killer, heart disease. He met members of the charity, Heart UK in Westminster yesterday (Tuesday, September 4) to support National Cholesterol Week. The charity is urging people across the UK to hold Hearty Tea Parties from September 17 to 23 to raise funds by getting together with family and friends to enjoy heart healthy food and drink. Julian said: “This is a great idea. It’s a social event with healthy food and drink while at the same time raising funds for a really worthwhile cause. National Cholesterol Week is also backed by celebrity chefs who are providing recipes for cholesterol-lowering dishes. Heart UK Chief Executive Jules Payne said: “I would like to thank Julian for supporting National Cholesterol Week and encouraging the people of Cambridge to get involved. 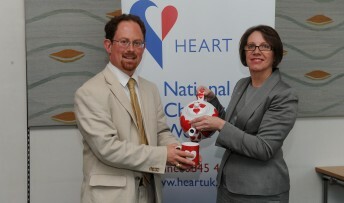 Julian is pictured with Heart UK Chief Executive Jules Payne at the Westminster launch of the charity’s campaign.